KS - You increase coherency and provide consistency between the stories in interesting ways – while also showing character development. At the beginning of the book, Hoenir can’t make any decisions while among the Vanir. Midway through, you reference this weakness in “The Theft of Idunn’s Apples.” By the final page, however, his experiences have enabled him to provide wise counsel. EE - I am glad you picked up on that. He’s sort of like a politician who starts out as a bright-eyed idealist, but at the end of his career becomes an elder statesman and seasoned policy-maker. If we’re to believe that Hoenir and Vili are the same figure, then he must have some sense to give, since he gave thought and reason to mankind. Plus, the Poetic Edda implies he is given the “wand of prophecy” after Ragnarök, which I did not mention outright, but drew in his hands as a regal-looking scepter, carved with idols – perhaps representations of Odin and Mimir. I prefer to believe that Hoenir was not stupid, but indecisive and overly-thoughtful. I can’t see Odin and Loki having a “dumb friend,” but they’d definitely hang out with someone who is consistently lost in thought. I figure maybe he started off as a man lost in thought, but he’d have to have picked up some good wisdom by the end, after hanging out with Odin all that time. KS - You make Thor’s goats “jötun-goats,” which explains why they are strong enough to pull his chariot. EE - It seems there are a lot of jötun-animals roaming around in the myths. But yeah, they have to pull his massive bulk around, and they can be eaten and reborn through magic. It makes a sort of sense. 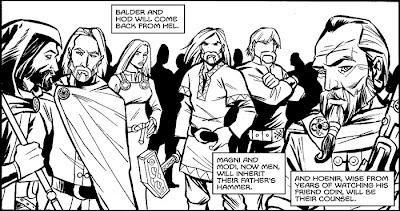 KS - In “Ottar’s Ransom,” your Hreidmar uses magic to weaken the trio of gods – which helps to explain how he could subdue and bind three powerful gods. 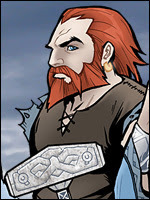 EE - Yeah, I’ve seen a lot of interpretations of Hreidmar as a farmer and magician and, of course, as a dwarf. I liked him as a farmer who dabbles in magic, because not only can he himself capture the gods, but his sons are remarkable, too. Regin grows up to be the advisor and mentor of Sigurd, Ottar lived as an otter by day, and Fafnir becomes transformed into a dragon. Clearly, this family knows its way around a spell. 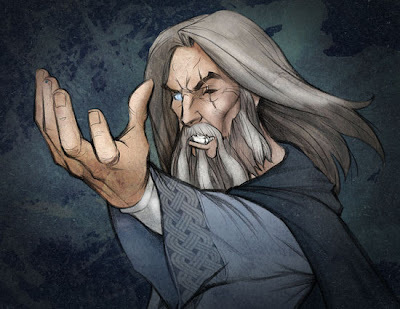 KS - Odin is often depicted in his guise of the Old Wanderer, but you argue that myths of Idunn’s golden apples of youth imply “that generations of gods exist as relative equals.” Your depiction of Odin is quite different from other popular interpretations. 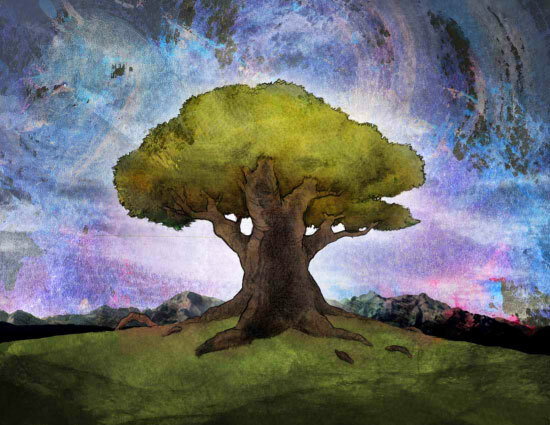 What are the roots of your portrayal? EE - Mainly, ease of storytelling. I put him in middle age for a number of reasons. For one, if you ate apples of youth all day, you wouldn’t get terribly old! Second, he still needs to be believable as the father of most of the gods. Third, Odin wears a lot of hats and has to be all things to all people, in a way. He is god of war, wisdom, poetry and death. He is a shaman and a chieftain and a wanderer and scholar. I chose to put him firmly in middle age so he would seem weathered, but he still had to be believable as a battle-hardened warrior and as a sorcerer in the same breath. We only see him as “the wanderer” a few times in my book, so I went more with the approach that he simply tries to escape instant recognition as often as he can, which I picked up from the D’Aulaires. Their character design is pretty operatic, but influenced mine a bit – especially the lock of hair over his missing eye. I like Ian McKellen’s portrayal of Gandalf as an Odin analogue, but I also like Neil Gaiman’s “Mr. Wednesday” and Bernard Cornwell’s version of Merlin as Odin analogues, as well. I tried to pay homage to all of these with my version of Odin. I personally like him as the god of inspiration – inspiration of battle, inspiration of poetry, etc. He’s a cerebral figure, a thinker, and a creator, and there’s no wonder he’s the favorite of many artists and mythology nerds such as myself. KS - You write that, after Odin gave his eye to Mimir for a drink from the well of wisdom, “Odin became all-knowing, and Mimir became all-seeing.” That’s an interesting idea – where did it come from? EE - I think it came from the D’Aulaires. Mimir should get something out of the deal, too, right? I think I kind of envisioned Mimir looking into the well and seeing everything Odin sees on Hliðskjálf. KS - Another intriguing concept appears in your description of Odin’s self-sacrifice on the World Tree to gain knowledge of the runes. You write, “After nine nights, he saw that the twigs that fell to the ground formed symbols, and those symbols became words.” That’s different from the Eddic version of the story. Where did your interpretation of the runes come from? EE - That comes from the D’Aulaires, again. This interview is causing me to realize just how much my vision of Odin is influenced by them. I must have read that book a hundred times, and they had such a great ability to make sense out of abstract concepts. It’s brilliant. KS - When Odin arrives on his mystic horse Sleipnir at the home of Hrungnir, the giant asks (in your paraphrase of Snorri), “Who are you, who rides his horse on the wind?” I couldn’t help thinking of the opening lines of Goethe’s “Erlkönig” – “Wer reitet so spät durch Nacht und Wind?” (“Who rides so late through night and wind?”). Did you ever study German literature? EE - Nope! I have a scholar’s sensitivity to this stuff, but I’m not a true scholar of mythology or German literature. 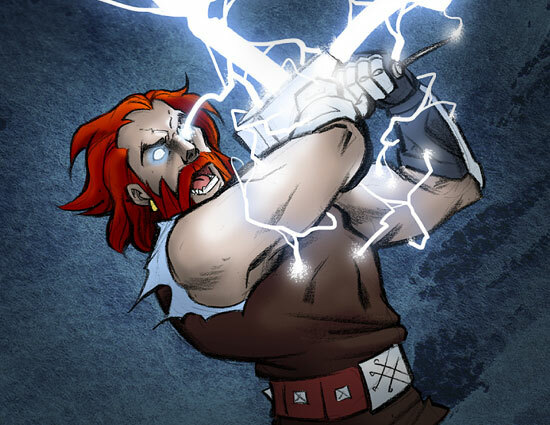 KS - Your version of Thor is closer to that in Peter Madsen’s Valhalla than that in Jack Kirby’s The Mighty Thor. 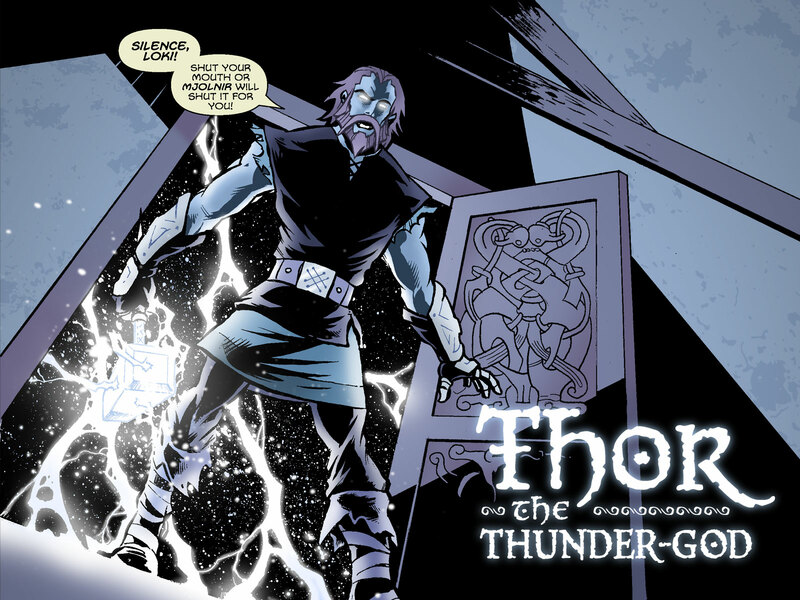 How did these earlier comic book versions influence your take on the god of thunder? EE - I never read either one, really. I was never into Marvel’s Thor, because I felt they took so many liberties with the mythological aspects of it that it didn’t really resemble the Thor I was familiar with anymore. Now they’ve retconned so much that they’ve explained away some of that, but it’s still pretty removed. 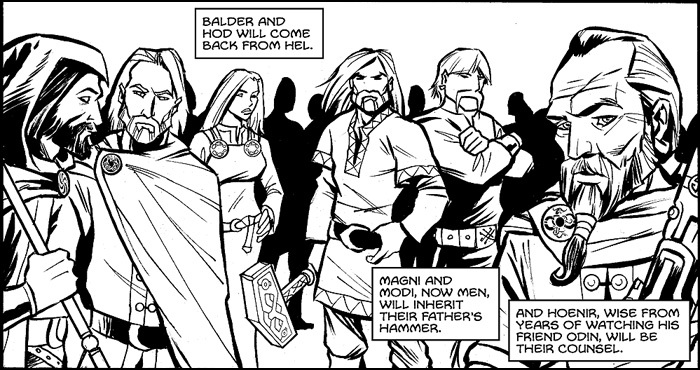 I knew of Madsen when I was working on Gods of Asgard, but had only seen his stuff on the internet, untranslated. His seems more targeted at kids than mine, but our character designs for Thor and Odin are kind of similar. That’s a coincidence, however. I think most appropriate versions of Thor would look like mine or Madsen’s. KS - It’s sometimes hard for those of us who grew up in the Marvel Age to separate childhood memories of comics and mythology. Was it “accidentally on purpose” that your Freya says, “I thought nobody could lift that hammer but you, Thor”? That concept comes from Stan Lee, not Snorri Sturluson – but it works well as a taunting remark in your book. EE - It was sort of a joke and reference to the “other” Thor, without being explicit. Clearly, plenty of people have picked up Mjölnir! I did make it really insanely heavy, though. We all know he needs a belt of strength to lift it and iron gloves to withstand its power, and he’s a pretty tough dude. KS - You have created a striking and unique version of Thor’s hammer. When are you going to partner with a silversmith and make this available as a pendant? EE - Thanks! I love the description of its handle being “a bit too short,” which is sort of a dig at his manhood. I tried to make it shorter than most war hammers I’ve seen, while still being usable as a weapon. But that’s a really great idea. Know any silversmiths?